Freeze Dried Vegetables and Fruits Market size will likely surpass USD 60 billion by 2025; according to a new research report by Global Market Insights. Increasing popularity of packaged food will be a major factor behind the freeze dried vegetables and fruits market growth. The product is extensively used in preparing many packaged food items such as soups, juices, ready-to-eat meals, etc. The advantages of the product over fresh fruits and vegetables will augment the industry growth in the forecast years. Freeze drying is considered as the best drying process for packaging food and beverage products as it maintains the structural integrity and preserves the flavor. Freeze dried fruits & vegetables have better aroma, rehydration, and bioactivity when compared to products dried using other alternative techniques. Other advantages include better shelf-life, higher amount of retention of nutrients, color & texture and easy rehydration capability. These factors, coupled with developments in drying technology, will propel the freeze dried vegetables and fruits market growth in the forecast years. Lack of awareness about the product will be a major factor that may hinder the freeze dried fruits & vegetables market development in the forecast years. Although the product is used in many packaged food formulations, the awareness level among consumers about its advantages is still low, especially in Asia Pacific and Latin America, where fresh fruits and vegetables are consumed at a significant rate. These reasons may hamper the freeze dried fruits & vegetables industry in coming years. Coffee beans is a major product type in the freeze dried vegetables and fruits market. A significant amount of instant coffee available in the market is dried using this technology. The segment will register a revenue above USD 5 billion by 2025 and will gain the market by a steady rate owing to increasing instant coffee demand across the globe. Chunks/pieces is a key form in which freeze dried food are available in the market. Fruits and vegetables chunks, pieces or slices are majorly used in a wide range of food products such as confectionaries, soups, bakeries, meal boxes, etc. The segment will register a revenue of approximately USD 30 billion by the end of the forecast years. Online retailers is a distribution channel that has been gaining immense popularity in recent years. Consumers are resorting to ordering packaged food products online owing to a range of factors such as hectic lifestyle, availability of a variety of products on a common platform, ease of payment and increasing internet penetration in developing economies. This distribution channel will gain the market by a CAGR of around 6% in the forecast years. Asia Pacific is a high growth market for the freeze dried vegetables and fruits industry. 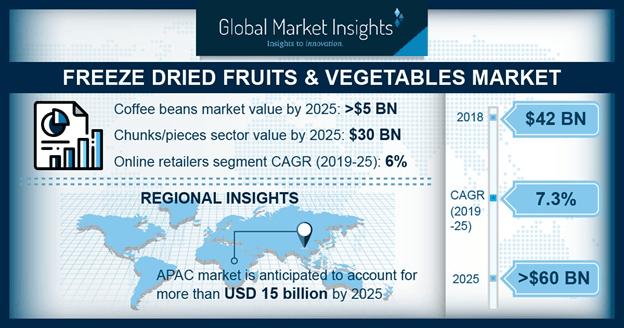 High population, increasing disposable income, and penetration of different retail formats are the major reasons behind the development of the Asia Pacific freeze dried fruits & vegetables market which will register a revenue exceeding USD 15 billion by the end of the forecast years. Key participants in the global freeze dried vegetables and fruits market includes, Mondelez International, Nestle, The Kraft Heinz Company, OFD Foods, Asahi Group, Olam International, Ajinomoto Co., European Freeze Dry Ltd., Mercer Foods, etc.